Are Distortions Standing Between You and an Awesome Retirement? Across the street from my office is an excellent ice cream shop (that I avoid like the plague). 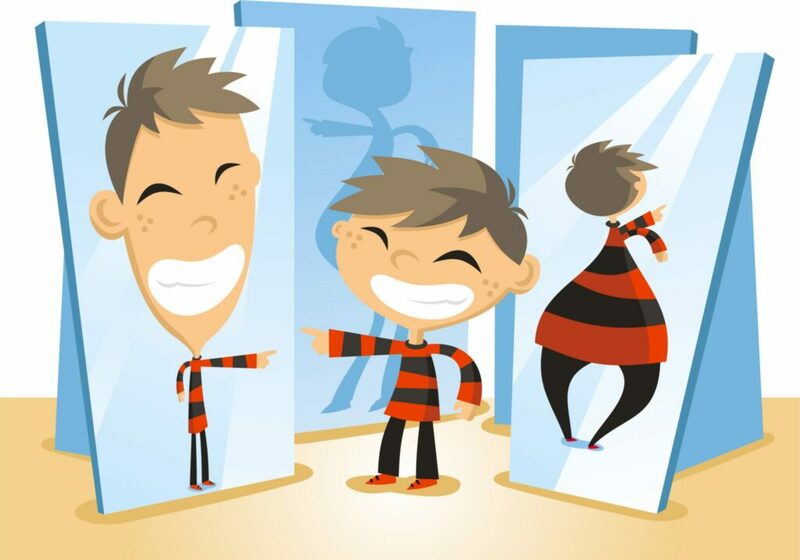 It has an old-fashioned funhouse mirror that distorts your image as soon as you walk in. Beliefs about retirement can have that same effect. By retirement, we’re not talking about the gold watch at age 65 followed by days filed with golf, CNBC and walks on the beach. We’re talking about today’s “retirement” – the time when you’ve achieved enough financial independence to leave ‘the grind’ behind and transition from your primary career to your next chapters. While it’s clear that a traditional retirement is virtually obsolete, governmental and organizational policies have not evolved. Except for the shift away from pensions and being on our own to sort out the financial side, when it comes to retirement, ‘the system’ hasn’t caught up yet. And, sometimes, we’re not fully aware of how some of our beliefs about retirement are also rooted in the old model of retirement. It’s time to examine those beliefs and update our thinking. When planning for retirement, our first thoughts are often about the anticipated joys of not working. I’ll lose the commute, that demanding boss, and especially some of those annoying co-workers. Every day will be a Saturday! An open calendar. Freedom. My life will be a financial services commercial come to life. Sailing, tennis, golf! (Don’t worry about never having done any of those things, I’ll have more than enough time to learn). Okay, then – Sailing lessons, golf lessons and tennis lessons. Lots of lessons. The constant drumbeat of advertising and articles remind us that we need to have a sound financial plan and enough resources for a retirement that may be as long or longer than our primary careers. It’s critical – and it takes planning, discipline and years of trade-offs and sacrifice. It demands our focus. Once we’ve achieved a degree of financial independence, we’re set. “Keep yourself busy” is often the advice. No one wants to be idle or lonely in their later years. (Have you seen my calendar? Now I have those darn lessons almost every day!). Once you’ve thought about what you want to do, you’re set. Planning for life in retirement is a ‘one decision’ type of thing. After all, how hard can it be? I’ll have all the time to do what I’ve always wanted to do. Many people focus on the timing issue. It’s a cornerstone on the old model of retirement. When can I retire? When do I want to retire? What’s my date? It’s hard to imagine, but nothing but fun can be a little boring in a way. The most highly satisfied retirees use the principle of diversification, not only in their investments, but in how they choose to allocate their time in retirement. While every retirement is different, the most satisfied ones describe a balance of interests and activities, often including some type of work. For some, its part-time work. For others, it’s unpaid work. Some people continue doing what they’ve always done, but in a different way, such as consulting. Others use it as an opportunity to change lanes and try something new and different. What the financial services commercials fail to emphasize is that it’s your time that’s your most precious asset, not your money. You can find ways to make money, but you can’t really create more time. During our careers, our purpose is pretty clear. Once we transition from that world, one of the biggest opportunities and challenges is redefining what our purpose is. That takes time, reflection and, usually, some experimentation to discover. Retirees who report the most satisfying retirements report a renewed sense of purpose – and it, in turn, drives how they choose to invest their time. There’s a difference between being busy and being busy with things that matter most to you. Many people skip the reflection and planning that helps them discover a new purpose and end up drifting, by default, into retirement. As a result, it’s easy for their time to get vacuumed up by other people’s priorities. In contrast, satisfied retirees are winning the battle of priorities and investing their time on the most meaningful things. And these tend to not be selfish pursuits, they often involve having a meaningful impact on others. When the concept of retirement was Otto von Bismarck in Germany in 1881 it was meant to be a short period of leisure when people were perceived to be less able to continue to work – physically and mentally. With longer lifespans the concept of retirement changes dramatically. Retirement today can consist of three distinct phases rather than one period. The first phase, often beginning in one’s 50s or 60s, is an active period, it often involves work in some way, perhaps an encore career, or perhaps travel. The second phase, often beginning in one’s 70s or 80s, is a period of slowing down somewhat. Still active, it may still involve work and/or travel, but at a different pace. Finally, the third phase, often in one’s 80s or 90s, is more limited. Each phase needs to be factored into our retirement planning. In the old model of retirement, much of the process was prescribed. Today, we’re on our own. People are retiring at different ages and stages. Investing in planning your life in retirement can hels a great deal. And the fact is that many of us will not be fully in control of the timing. According to multiple surveys, over 60% transition to retirement years earlier than planned, due to major life events such as the loss of their job, health issues or the need to be a caregiver. Taking some time to plan and design your life in retirement is a wise move, including if the timing is earlier than anticipated. The old model of retirement is mainly gone. We’re on our own – and we need to chart our own course. We use an in-depth assessment tool that helps our clients get clarity on where they are ready for the transition and pinpoint the specific areas that need attention as they begin and pursue their journey. This helps avoid the tendency to drift and hit your stride earlier in your next chapter. After all, isn’t that why you’ve been working so hard to achieve financial independence? (2017). Transamerica. 17th Annual Transamerica Retirement Survey. (2016). TIAA. The 2016 Voices of Experience Survey. (2014). Merrill Lynch/Age Wave. Work in Retirement: Myths and Motivations.